My name is Mark. 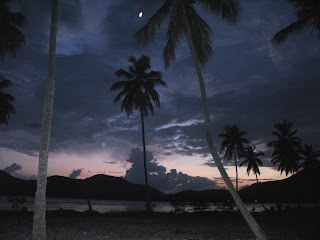 I am a recent graduate of Dartmouth College, and I am spending the 2008 summer in a small village roughly 5 miles off the southern coast of Haiti. 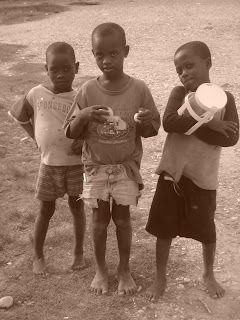 Vilaj Espwa (Hope Village) is a haven for Haitian children whose day to day lives are dictated by hunger and generally sub-standard living conditions. My primary contributions here are in the areas of public health and athletic organization. My final week in Haiti has been diverse and memorable. We finished the houses by Friday, and even started putting in some newly-sewn colorful window curtains. I wish I had taken pictures of the houses when I first got here so that I could show the tremendous before-after difference. I think we have truly turned these houses into homes, as Paige's project title describes, and although only time will tell if our spraying, caulking, painting, and restructuring will effectively keep the bedbugs out, I know that if I were a bedbug, I'd be looking for a different place to stay. Scooby, a veteran contributor at Espwa, took me over to his girlfriend's family's home for dinner, and also early in the morning for coffee. I was really appreciative of that, because it allowed me to really get the flavor of the local villagers' typical lifestyle: how they cook, how the eat, what they talk about, what they think about, how they interact. It's a very simple life by my standards, but they are used to it, and to them a "hustle and bustle" life of suits, deadlines, and detailed schedules would be strange and discomforting. Although Haitians generally don't value materials and time-efficiency the same way we do, they make absolutely sure that their guests are content. I think that hospitality is a universal value, and to me that's a very neat thing about all people--no matter how rich, poor, simple, or fast-paced a culture's lifestyle is, everyone takes pride in their own group, and wants visitors to remember it in a positive light. On Saturday we went to yet another beautiful beach. On the way in, we were held up by a giant bus crash in which 29 people died. Something like that puts a bit of a damper on a sunny beach trip. Apparently it was the largest automobile wreck in Haiti in 2 years, although they are actually quite common. In fact, 2 days ago I received an e-mail from a man in Germany whose Haitian wife had been in a car crash. He had found my blog through an internet search, and seeing that I was near Les Cayes and had been to the General Hospital, he was hoping to gain some information on her and the hospital. I got the number and sent it to him, but before going to the hospital, I received another email from him that he had finally gotten in touch with his wife. She is not seriously injured, but she is seriously discomforted by the quality of her treatment and the savage conditions around her. I feel terrible for both of them--the wife for feeling alone and unsafe, and the husband for feeling helpless and far away. This is just another example of how, when things go wrong in Haiti, the distress is much greater, the aid is much weaker, and the resolution is much slower than in places like Europe or the States. On our way out of the beach, we saw some ruins from the days when the French were battling intruders for rights to the Island. There is also an extensive history of piracy associated with Haiti. Several of the infamous Captain Morgan's ships are apparently below the coastal waters of Ile a Vache. Haitians still acknowledge the existence of pirates, which smuggle black market things in and out of Haiti. Sounds fascinating in a way, although I doubt these "modern-day pirates" have eyepatches and parrots and planks. On my last morning at Espwa, I woke up at 3 to get my last run in before we left for the bus to Port-au-Prince at 4:30. 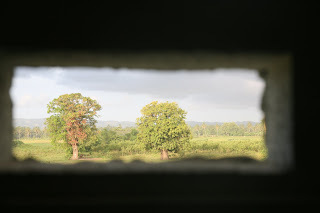 It was quite an experience to tread through the high grass and mud of Haiti in pitch darkness, hearing the sounds of toads croaking, Voodoo drums in the distance, and seeing small pairs of yellow cow eyes staring at me in the pitch blackness. It was a little scary, but more than that, I had a feeling that I was having a really fantastic and rare experience in my life. I mean, how many white suburban kids are running laps around cows in the dark at 3 in the morning in Haiti...not many. So, I guess what I felt was pride in the uniqueness of my situation. That day was a long and informative one. In Port-au-Prince, we saw several art galleries, the Capitol Estate building (which is like a bigger version of the White House), historical museums, grand views of Haiti from high points, disgusting and tragic alleys displaying the poverty of this city, famous hotels, and a million different faces. We saw the anchor of Christopher Columbus's ship the Santa Maria, a 20 lb. golden crown, covered in an assortment of dazzling jewels, that was worn by ancient monarchs of the island, and a photographic timeline of all the leaders of Haiti since it gained its independence in the late 1700s. Seeing as more than a third of Haiti's population resides in Port-au-Prince, almost everything historical and significant having to do with Haiti is here in its capital. I'm glad I got to see it so extensively before leaving; it makes me feel like I experienced both the urban and rural aspects of Haiti. Tomorrow I go home, and I can't help but wonder what my reaction will be to the stark change in lifestyle. My life in the U.S. and my experience in Haiti are like two different worlds, not just regarding what I have or have access to, but also how I am expected to act, what my goals are, how I look for fulfillment, and how I view the projectile of my life. There's no doubt that I am looking forward to what is waiting for me in North Carolina, and then in Chicago. However, after seeing that this world exists, I find the thought of re-injecting myself back into 'life as usual' a bit disturbing. While I am eating nice meals, thinking about school deadlines, and following ESPN results, this place, and these people, will still exist, and their situation will not change much at all. 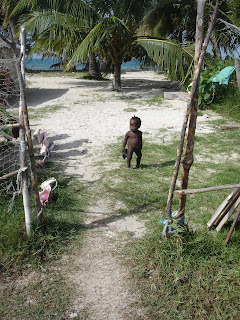 Of course, they have existed long before I came and saw Haiti for myself. I suppose it bothers me that such a powerfully desperate situation, and so many unfortunate lives, can be completely out of my scope of awareness while I am in a far away life, continously occupied by things that are, relatively speaking, entirely insignificant. Most discomforting of all is my certainty that I will inevitably adjust to my padded life back at home, and the memories and concerns of this place will begin to lose their freshness and power. I think that acclimation to one's environment is a natural human tendency, and I can't hope for my experiences in Haiti to continue to captivate me and consume my mind the way they do right now. Nevertheless, I came here to develop a relationship with Pwoje Espwa, and with Haiti in general--I owe it to myself and to the people I've met here to come back. The relationship has been formed--I have seen this place; that is an important first step, but I want to contribute in a more profound way in the future. Therefore, I like to think that reinvolving myself in the routines and stimulation of my life at home is not a tragedy so long as I maintain that relationship. I think that changes in scenery are a common and important part of life. Though it is often hard to leave certain times and people behind, there are always new rewards ahead of us in the form of new places, and new experiences with new people. But revisiting old scenery is also one of the rewarding parts of life. I was only in Haiti for a summer, but my time here has impacted me significantly, and I think that my experience here should not be allowed to fade away and be forgotten. I may go back to life as usual, but I will go back with knowledge of another world. My passions and convictions about this place may dilute for some time, but they won't disappear. I don't think anyone who has experienced Haiti could ever forget it, and that's what makes me confident that it is not a question of whether I will come back, but when. This past weekend was loaded with spectacular sights and activities, and again I found myself feeling a bit strange to be vacationing in a 3rd world country. On Saturday we saw the picturesque and remote Ile a Vache where Dutch author Dan Gert is building his sailboat for the nautical trek to Florida. There was a festival going on there this weekend, so there was good authentic barbecue on the beach, and all the locals seemed in good spirits. On Sunday, we went deep into the mountains and forests of southern Haiti to an opening where there is a giant waterfall and natural pool beneath. It was remarkable, so remarkable that my camera decided to stop working almost immediately upon arriving...I made sure other people snapped plenty of shots. There was a big jump from about halfway up the waterfall that several of us did--real exciting. This morning, it was back to work, and it was a looong day. There's so much to do, especially because our deadline for finishing the houses (and letting all the kids move back in) is Friday. George, Webert and I worked overtime, and I think we were very productive--tomorrow won't be any easier, but the prospect of finishing this project before I leave is good incentive to work hard. The houses are coming along great. The first 10 have been completely finished, and all the kids have moved from the back 10 houses to the 10 finished ones--now we will start re-doing the back 10. I have been spending most of my time putting in new doors, locks, and door handles, and fixing old ones. Weber has been doing most of the insecticide spraying, Paige is leading the charge in painting, and Will has recruited a strong force of caulkers to fill holes in the walls. I hope we finish these 10 before I leave--we are low on supplies, so I'm going into town today to make some purchases. 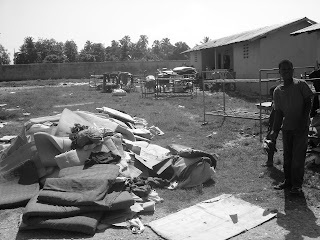 The past 2 days, we made a huge pile of old beds and sheets out in one of the back fields and burned them--the kiddies now have new beds in the first 10 houses. This weekend we are going to Ile a Vache, a small island off the southern coast here, where the Dutch author is building his sailboat. We are renting a motorboat to be able to get around on our own schedule--it costs about $100 for the day. We are going to drop some supplies off at an companion orphanage in the morning, and then go to the other side of the island for the afternoon to take a sailing trip and see Gert's (the Dutch author's) area. Apprently there will be some festival going on there this weekend. On Sunday, we are going to some caves and waterfalls that Dan has been talking about, but I don't know much about them; sounds adventurous though. My runs through the countryside are always great, and the "gym" has been busier lately--I think it's becoming more famous. I told the guys in French that they could charge people a little bit to work out there; they laughed and replied in Creole, "OK, you can pay us tomorrow." Can't argue with that I guess. I have posted a new slideshow of pictures, which I think provide a good summary of my time here so far, and provided captions for some of them. Of course, to get the full experience, you have to come see it for yourself! My parents left yesterday morning--the week went by really fast, and I'm sorry to see them go. We were very productive with them around. On Friday, we went for a long walk through the countryside, and saw a lot of typical rural homes and farmland. 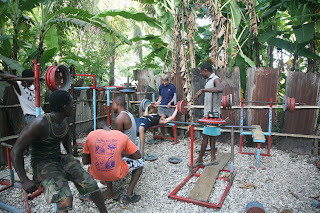 We also went to a "gym" that was built up by Francois, Espwa's "security guard," in his back yard. In fact it's closer to a pile of old used car parts than a gym, but there's actually a lot of exercises you can do there, and just being there is an authentic experience in itself. On our walk to the gym, I was able to trace a new running path, so now I can run through the villages and countryside, rather than just around the soccer field. I did the run yesterday, worked out at the "gym", and ran back. All the while, the villagers shout "Blan! Blan!" meaning "white person" or "foreigner", and smile once they get a wave or a smile and a "Salut" in return. I did the run again today, but this time went much farther, past the gym, and saw a whole new part of the region. That run is the most cultural part of my day; I feel like I have been thrown into a national geographic video, especially when I have to jump over a sleeping goat, or when naked children offer me sugarcane when I pass by. The little ones were begging me to watch a movie on my computer today, so I let them watch "Anchorman." I had to place the computer on a chair inside our gate, because if you leave it to them, it will inevitably get broken. That's what happened to my iPod. They all crowd around and want to press all the buttons, and something bad happens. This way they were able to enjoy some video entertainment, and I was able to keep my machinery intact. We also played our usual game of tag, where the kids gather in a circle around me, and I close my eyes and spin around with my arm out. When I stop spinning and open my eyes, whoever I'm pointing to is the kiddie that I have to chase and tag. They can't get enough of that game; they're all giggling and yelling throughout the chase, and a big cheer erupts when I finally catch them. I finalized the locks for the first set of houses today, and tomorrow will be another long day of putting new locks on the second set of houses, and caulking up all holes in the walls to keep the bedbugs out. Thanks again to my parents for their time here--everyone here has expressed great appreciation for their contribution and their contagious upbeat attitudes. A lot has happened since my last post. This past Saturday, I went with Linda to the main hospital in Les Cayes because there was a baby of a worker here who was severely dehydrated. The hospital conditions there, as you can read about in Will'S Blog, are horrendous. Not only are the rooms dirty and foul, but all patients are forced to buy and bring their own treatments! IV bags, medicines, needles, even mattresses are not supplied--diagnosis and administration of supplies is offered. What a crazy place. On Sunday, Dan and I flew to Port-au-Prince to pick up my parents, and then we made the 4-hour scenic southbound drive toward Les Cayes. We ended up driving right past Espwa and going to Port-Salut, one of the most picturesque beaches I have ever seen. It's interesting that a country like Haiti, which is so plagued by poverty, misery, and filth, can be home to such exquisite, seemingly untouched beauty. This "mini vacation" at times felt a little strange, considering the general purpose of our time in Haiti, but was pleasant nonetheless. On Monday morning, it was back to work, this time with much-appreciated new help. My parents have been a significant force here--it's actually hard to imagine that we would have stayed on schedule with the children's Houses without their help. They have led the charge in caulking and spraying the houses, and have taken a lot of initiative in repairing doors, installing new locks, and taking inventory of what there is left to do on specific houses. They have also spent several hours each day at the clinic seeing patients with Dr. Jakob, and even introducing Jakob and his (small) staff to some equipment and tools that have been brought down, but never used, by previous visiting physicians. We dusted off and brought out an old electrocardiogram, and used that several times today on patients with high blood pressure or histories of heart problems. That was headed by my dad. My mom's knowledge is a little more pertinent down here--there are many more gastrointestinal problems in a place like Haiti than there are cardiovascular problems. My mom revived the old microscope and some other gadgets for reviewing stool, urine, and blood samples. 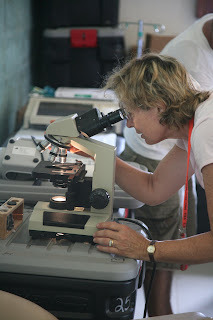 Both my parents have been very helpful at the clinic, but have also enjoyed learning more about tropical diseases like malaria, as well as renewing their primary care skills. They have also been great with the kids, which is fun to watch. My dad is big into photography, so he has also taken on the responsibility of artistic documentation, which is important, and fun for him; the kids love the camera too. The pictures I posted today are a few of his. "Don't Let the Bed Bugs Bite" is pretty much on schedule, but we've been forced to work longer and harder than usual. Even with the help of my parents and several other very competent boys like Weber, it's tough to zip along through these houses. After tomorrow we'll be halfway done, although some coordination with the carpenters is required, and we will eventually need a little more funding for a few more supplies. There was a Dutch novelist visiting Espwa today, and he was a really interesting guy. He is building a sailboat from scratch and sailing from Haiti to Miami--he hopes to write about and gain insight into the not-so-uncommon attempt of Haitians to escape their poverty. It's an ambitious idea, not only because of the difficulty in building a sturdy and reliable boat out of raw planks of wood, but also because of severe Carribean storms and Hurricanes. 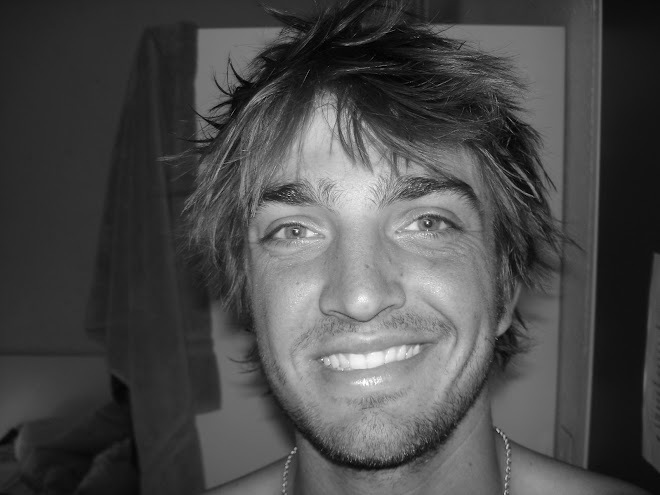 Whether he makes it or not, I think it's a cool idea, and he seemed like a great guy. He is living right now on Ile Vache, a small island off the coast, and Dan and I are planning to go stay with him for a weekend and sail around a bit--should be a cool experience. The next 2 days should be interesting. 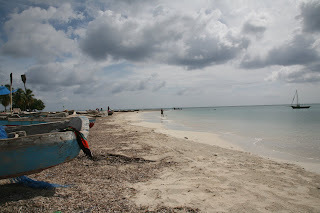 In addition to moving along with the kids' houses, we will be going on a tour of Les Cayes (led by Linda) to catch some of the images you don't see in the newspapers. We are planning to have the director of the hospital in Les Cayes show us the whole hospital--hopefully my dad will be able to take some pictures there. Dan has also offered to take us on a walk around the village for some more photography opportunities, as well as some general history and current event information on the local area. Dan knows a lot, so an hour walk with him is the equivalent of like a 6 hour museum tour. I am hoping to contribute further to Pwoje Espwa upon returning to the States through fundraising--this place needs contributions badly. If you feel compelled to give money, please visit FreeTheKids.org. If you want to ask further questions about how your money might be used, or if you are interested in contributing to a specific cause or project, please contact me at markbrodie@alum.dartmouth.org, and I will update you on what is going on at Espwa now. Several days ago I had my first "patient." There was a young boy with a cut foot who I cleaned up, wrapped up, and sent off with a smile. Of course almost anyone could do that, but it still gave me a really good feeling, and a tiny glimpse of the internal reward of practicing medicine. The next day, things got a little more serious. 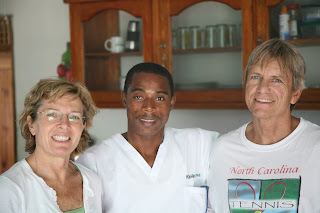 I assisted the Haitian physician ("Dokte Jakob") with a surgery, and it was no piece of cake. The boy had what I thought to be a Guinea worm in his neck, but it turned out that it was a metal piece of a belt buckle that was completely buried under the skin. I later learned that one of the child's parents had beaten him with a belt, and had now brought him in, 8 days later, because the area was swelling and painful. During the entire surgery, in which Jakob removed the metal bar, the child was squirming and screaming at the top of his lungs. Everyone was looking with pity and discomfort on their faces--it was not a pretty sight. Jakob put plenty of numbing medicine on the area before making the incision, so he assured me that the child's screams were out of fear, and not pain. This knowledge, however, made the process no less grueling. Afterword, I asked whether the parents would be reported for abuse--"maybe," Jakob said, but in Haiti this is not at all uncommon, and even if they were reported, most likely nothing would be done. I'm reminded every day, in many different ways, of how primitive it is here. Most of my time not spent in the clinic has been spent detailing the timeline for our "Don't Let the Bed Bugs Bite" project, as well as going into town to buy supplies. Every house needs to be cleared out, bombed with insecticide, painted, re-bombed, and then we move in the new beds and furniture. There are 20 houses that need this treatment--it looks as though, barring any major unforeseen problems, we'll finish this project before I leave. Pretty exciting. I've also been helping Will outline his Malaria project proposal, which has 3 phases: treatment, prevention, and education. Hopefully that will be approved and up and running soon. I'm also excited for my parents arrival on Sunday--they'll be a significant helping force in the medical clinic, and are bringing numerous medical (and other) supplies with them. Although I'll be busy bombing houses with insecticide and touching up their insides with caulk, I still hope to spend a good amount of time watching and helping them.